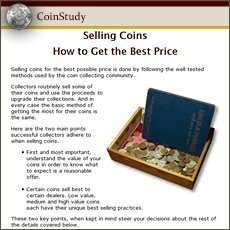 CoinStudy's coin value guide lists how much US coins are worth - wholesale, covering all the major coin series, from cents to gold. Here is a quick, behind the scene look, at how values listed in the guide are determined. The following series are updated weekly to reflect the change in bullion value: Silver dollars, half dollars, quarters, dimes, silver nickels and all gold coin series. Collector coin values follow a slower and steadier trend. Starting in January the process of gathering information for this year's coin value guide begins. More than two dozen dealer's retail price lists are consulted, with the objective of acquiring from 3 sources a minimum of 3 values for each date - mintmark - and condition. Entered into a spreadsheet, prices are collected of all the different coin series. Further research of major coin auction firms and their auction results is also needed to add to the data. At this point various wholesale markup factors, which are influenced by rarity, condition, popularity, even metal content, are entered into the spreadsheet program. The resulting equation takes an average of the 3 values and reduces it by the wholesale factor, providing the numbers behind the Coin Value Guide. A bit of a technical explanation, however, the calculating power of the spreadsheet provides a realistic worth of your coin. Values are updated to the web by mid March. 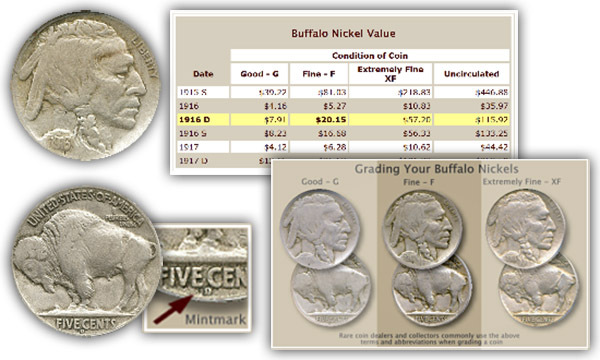 Let's use a Buffalo nickel as an example and research its value. Many a Buffalo nickel is found in a box of old coins, and it is the date, mintmark, and condition that has the greatest pull, up or down on values. Starting with the date, this example is an earlier year of the Buffalo nickel series-1916, already a good sign. Early date Buffalos are listed as having higher value. Checking the reverse, the "D" mintmark is found, indicating the Denver mint produced the coin. Another very good sign, as mint marked issues of the early years are scarce. Next, judging the condition of the coin. Here the 1916-D closely matches the grading image coin in "Fine" condition. Our 1916-D shows a little to much wear to reach the next higher grade, but is a solid "Fine" grade. And now the value chart shows a respectable old 1916-D Buffalo nickel is worth a respectable $20 in Fine condition. By using the coin value guide, checking the dates, mint marks, and condition - your old coins begin to tell you how much they are worth. Collector demand is pushing values for these old copper coins higher. The obsolete Half Cent, is always in short supply, and the popular American Large Cent is gaining value steadily. Lincoln and Indian head pennies, continuously collected since their introduction, are sought by today's determined collector. This year's coin value guide shows penny values are easily ahead of last year. The nickel series of US coins holds many surprisingly valuable dates and mintmark combinations. Buffalo nickels are a good example, values of the earlier years have risen strongly as their true scarcity is realized. Shield Nickels and Liberty Nickels each contain numerous rare dates. Value charts covering the entire series combined with grading images to judge the condition of your coins, leaves no questions as to your old nickel values. Silver US coins are a large and collectible part of the hobby. A huge and diverse variety of denominations and designs making up a substantial part of the coin value guide. Dime values have changed, they are higher, some much higher. Historically important and rare Bust and Seated dimes remain on a continual up trend. Mercury dimes, one of the widely collected series have rewarded their owners with value gains. Grading images are helpful to uncover which quarters are rare in well preserved condition. The coin value guide records steady increases, a fact dealers and collectors are keenly aware. Have a second look at your Standing Liberty quarters in particular, many have reached surprising values. First minted in 1796 the Bust half dollar variety is a scarce and valuable coin. Next, Seated Liberty and Barber halves must be examined closely, rare dates, mintmarks, and condition cause wide differences in value. Auction results show Walking Liberty halves are very popular. Large, majestic and at the top of most collectors and dealers want lists, values of silver dollars just keep advancing. From the colonial Bust Dollar, to the classic Seated Liberty series, followed by the bold Morgan and futuristic Peace Dollar designs, all are avidly collected. Bring out your old silver dollars find their remarkable listings in the coin value guide. Handle your gold coins carefully. The high gold content value is just the start. If your gold coin is a rare date or in excellent condition it is easily worth multiples of the minimum gold value. Every US twenty dollar gold coin is now worth over $1,256 . Every one of your gold coins is scarce and many are rare. Even the smallest denomination, the Gold Dollar has a minimum value above $210. Return to the Coin Values Discovery home page... from Coin Value Guide. An excellent index with images and text links to all coin series, from Cents to Gold. Value charts, grading images with descriptions uncovers the value in your box of old coins.